This video was filmed in 1997. Carol visited Kapciamiestis at the end of June. Where were they, where are they? Do you have news or photos for us? Jews once lived in the shtetl and gmina (rural district) of Kopciowo, Suwalki gubernia now known as Kapciamiestis, Lithuania. This was a small community and many of its residents were related by marriage. They lived here from the late 18th century until 1941. No Jews live in Kapciamiestis today. A few lucky ones emigrated before the start of WWII, a handful survived and most were murdered in the Katkiske Ghetto, Lazidai. Today, their descendents can be found throughout the world. We are 3 genealogy fanatics who met because of our interest in this small place. We dedicate this page to the memory of a community our ancestors loved and called home. Please join us in our effort to collect and make available as much information as we can. See the new fence as it stands today!
. The drive is about 2 ½ hours. I had made appointments in advance with the Elder, the school and the Priest. It needs to be stated here that I do not know Lithuanian. Although I had written to them in advance in English and a rough translation, it was Rashele who phoned them to verify and remind them about the appointments. Here we are on the main road entering Kapciamiestis. The cemetery is well kept albeit the stones show the effect of the extreme weather conditions there. Moss has started to show on the existing stones, and some moss has grown over the broken stones. Nevertheless, there is no sign of weeds, rubbish or visible animal visitations. 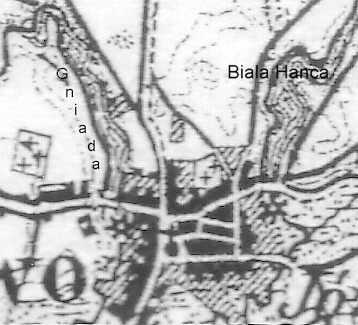 This is a magnified segment taken from a 1909 map of the area. When compared to a detailed 1985 map of Kapciamiestis, it was obvious that the underlying layout of the town centre had barely changed in the intervening years. The Jewish population lived mainly in the town center within easy walk of the synagogue. The cemetery is on the outskirts of the town near the Neda River and the main road to Viesiejie. With help from elderly residents of the town and 3 ex residents now in Israel, it has been possible to create a map which with reasonable accuracy indicates where our ancestors lived. The Illustrated Geographic Atlas of the Kingdom of Poland (Atlas Geograficzny Illustrowany Królestwa Polskiego) Maps from this 1907 Atlas are on the Polish Genealogy Society of America Kopciowo is on map 83 . Maps of Lithuania (in Lithuanian): Detailed map with Kapciamiestis circled. A map of the Holocaust in Lithuania is found in Lietuvos istorijos atlasas. Vilnius: VAGA, 2001.